Card #4 for the Caring Hearts Card Drive. Supplies used: Precolored digi image from Dearie Dolls, Recollections Christmas paper, EK Success Snowflake punch, MS tag punch, Scrapbook Adhesive dimensional dots, pearls, twine, image and border were cut out with my Silhouette Cameo. What a cute card Deloris, I love the Christmassy colours. 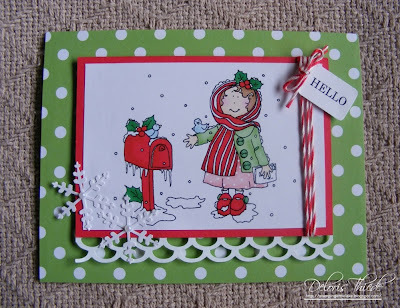 The green polka dot paper is fabulous and I love the addition of the twine on the side of the image panel. Great digi stamp too! What a cutie and such a pretty layout. Thank you so much for sharing your lovely creation with us at Creative Card Crew. It's precious! You know how I love dearie doll and yet I have not made any cards with them lately. I'll have to look lower on you post to see about this drive. Your image definitely looks like she has a caring heart. I love the traditional Christmas colors!! I love traditional colour and thank you for reminding me to use my bakers twine. Thank you for joining us at CHNC Extra with such a lovely card. What a sweet precious card! your coloring is amazing. Thanks so much for sharing with at Inspiration Emporium!